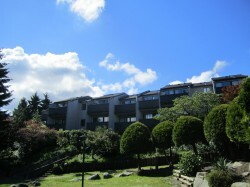 Vancoeverden Court is at 1099 Sitka Square, in the beautiful False Creek area of Vancouver near the water and seawall. Built in 1978, this is a non-profit, mixed income, affordable housing project. Residents have access to a community room for meetings and activities. Granville Island and the South Granville shopping district are nearby and a short stroll over the Granville Street Bridge brings you to Vancouver’s downtown and Yaletown. Due to it’s location and affordability, Vancoeverden Court remains one of our most in-demand locations for seniors. 12 small bachelor suites, 12 larger studio suites, 27 one-bedroom suites for seniors.